The skin consists of 3 layers, namely, the cutis, the dermis and the epidermis which is the outermost layer. It takes roughly 28 days for the cells of the dermis to travel upwards to form the new epidermal layer. Of course, this growth of cells depends on a variety of factors such as sunlight, age, skin disorders, etc. which can accelerate or retard the process. The adult skin covers an area of about 18, 000 sq cm and weighs around 3.2 kg in women as compared to 4.8 kg in men. Isn’t that quite a sizeable proportion to look after and more so when it has to face the winter breeze? If one has an oily skin, one should avoid harsh soaps and hot water, both of which tend to overdry the skin and in turn overstimulate the sebaceous glands. Try and avoid mineral oil, a.k.a. liquid paraffin, paraffin wax or petrolatum based moisturizers – these are not absorbed well, all they do is sit on the skin’s surface and block the pores. Also they do not moisturize your skin well. Additionally, application of such moisturizers over a period of time poses potential health risks. Oily skin is best taken care of with a water based moisturizer. However certain oils such as jojoba oil is non-comedogenic and is perfect for oily skins as it provides proper lubrication without being too heavy or too oily. Try to find organic moisturizers that have ingredients such as Cynergy TK, Phytessence Wakame and Nano Lipobelle HEQ10, or at least a few of these. Dry skins, on the other hand need constant and frequent moisturizing, especially to fight the harsh and dry winter air. By the way, some of the natural ingredients that you should look for in a dry skin moisturizer include Macadamia Oil, Avocado Oil, Shea Butter & grapeseed oil. Added skin rejuvenation ingredients like Cynergy TK and antioxidants such as CoQ10, Phytessence Wakame & active manuka honey extract help to rebuild collagen and elastin . The presence of at least some of these ingredients in your dry skin moisturizer / cream can effective beat dry skin woes and provide lasting hydration. At the end of the day, make sure you remove your makeup giving special attention to your eyes. An easy way to remove eyemakeup is to use coconut oil / olive oil /almond oil and a cotton swab. Wash your face thoroughly with a cleanser. Also do remember to splash your eyes with cold water to get a clear look. Apply a toner or just splash plain cold water on your face. It cleanses, soothes and refreshes. Apply a good moisturizing cream or lotion, suitable for your skin type or according to the season. Before retiring, apply a rich night cream enriched with oils which can benefit a dry skin in winter. Winter weather really calls for this weekly pampering routine for your skin to maintain a healthy look. It takes an invigorating 20-minute session. Follow these steps. Cleanse yourself thoroughly and tone the skin. Slough off dead skin with a mild scrub. Better still, make a paste of besan (gram flour), atta (wheat flour) or bran in milk and apply using circular movements. Concentrate on the forehead and sides of the nose and chin. Rinse off thoroughly using a damp cotton swab. Replenish skin with reviving moisturizing or hydrating masks. Do not apply it near eyes or lips and then relax for 15 minutes while it does its work. Wipe off with a damp cotton swab and rinse off the last traces by splashing with normal water. 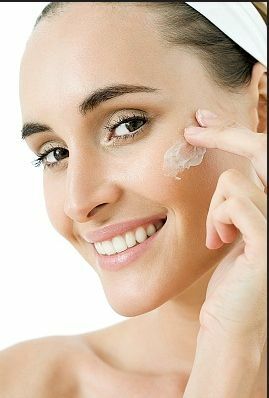 Apply a fine layer of moisturizer, according to your skin type, and leave it on. Although the steps shown above are meant for the face and neck, it does not mean that we can neglect the rest of our body. Skin on the other parts get dry too but it is the face, hands and feet that are exposed and so more prone to be affected by the cold weather. Body skin can be cared for by following a regular or thrice a week oil-massage or ‘abyanga snana’. The temptation to bathe with extra hot water to fight the cold should be curbed. If a daily oil-bath is not feasible, you may add a few drops of oil to the last rinse and keep the temperature as tepid as possible. Besan or bran made into a paste with either curds (yogurt) or milk acts as an effective cleanser, besides imparting the required emollience. Knees and elbows are usually neglected or forgotten. Elbows and knees usually have dry skin around them and so need a lavish massage with oil or body lotion to make them supple and soft. But that’s not the end of it all. We all turn to room heater, convectors, radiators or the sun to beat the winter chills, little realizing that heat takes away moisture from our skin. As it is, the winter weather is dry and less humid, in a room that is already deficient in moisture, heat does more harm than good to the skin. A golden rule that must be remembered is: “Heat or cold, anything in extreme, plays havoc with the skin.” It can be in any form – direct or indirect. Even very cold or very hot water can harm the skin. Very hot water takes away oils from the skin. Everyone loves to bask in the winter sun. A winter sun can damage the skin as badly as a summer one. So when you are out in the sun do not forget to apply a sunscreen lotion / sunblock on the exposed parts of your body. Remember that UV rays from the sun can cause premature aging and wrinkles. However it wouldn’t be fair to advise you to avoid the winter sun altogether because everyone loves the warmth of the sun in wither cold. Face sunny days with sunscreen protection instead, more so since you do not want to look older than your actual age. As for clothes, the roughness of winter clothes can irritate the skin beyond tolerance level. This is best avoided by wearing clothes starting with the softest next to your skin. • Place a bowl of water near the radiator or the heater kept in the room for central heating. It prevents excessive drying up of the air enclosed in your room. • Keep household plants indoors. They add humidity to the atmosphere and also absorb certain harmful chemicals contained in the air in your room. • Avoid long, hot baths. They can rob precious oils from your skin. • After shower, do not rub roughly to dry off, but pat your skin dry. • Use cotton undergarments in winter to combat the problem of friction. Avoid wearing a pullover directly over the skin by wearing a light vest first. • Air your woolens, as it is easy to believe that in winter we do not sweat, but the dead skin is constantly shed and the body odour spoils the woolens. • Avoid using harsh astringents that contain alcohol. Use only water to cleanse your face. • Use a moisturizer and a lip balm (as required) lavishly. • Keep a small container of hand cream in your bag and apply after every hand wash.
• Even nails seem more brittle and cuticles dry more during winter. Apply a good quality cream for prevention in winter. One of the most economical home remedies is a mixture of equal quantity of glycerin and lemon juice. Apply it at night to soften the hard skin. • Apply rich, protective creams enriched with oils to your neck, face, elbows, knees, hands & legs , feet etc before retiring to bed. • If the nights are terribly cold, use good cotton socks for your feet and gloves for your hands to beat the cold and keep the moisture of creams and lotions locked in! • Hair care in winter is even more important as the dandruff problem becomes more acute. Keep your hair and head covered to save it from the harmful effects of the sun and pollution in winter. • Water intake reduces naturally in winter, so keep a watch on your liquid intake. We feel thirsty much later than the body really needs and demands the liquid. • Diet is important. Keep it healthy and pay attention to antioxidants like vitamin A, C, E and also the minerals needed to nourish our bodies during winter. A skin care regimen works but it does not work miracles because a lot depends on your system, hormones, lifestyle and food habits – all these make a large contribution to your skin’s condition. Furthermore, this winter the mercury has plummeted to an all-time low (record-breaking) in India gripping both the Southern and Northern states in a cold wave-like conditions, North India experiencing dense fog and extremely cold climatic conditions. So this time around winter skin care should take utmost priority.